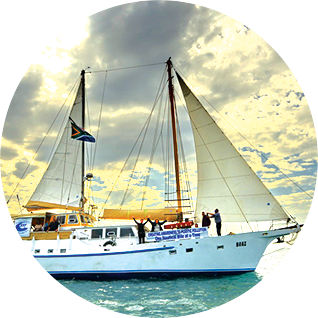 The Motor Yacht BOAZ is used in collaboration with the Sustainable Seas Trust to promote our common goals. We endeavour to educate school students and consumers alike to become responsible users of plastic so they can make informed decisions about how and when they use plastic and the impact it has on our oceans. Sea birds and mammals consume plastic, and an increasing number starve when their stomachs are full of plastic waste. Studies reveal an alarming fifty two percent of sea turtles worldwide have ingested plastic debris. The decisions we make on land concerning plastic usage ultimately end up affecting the health and sustainability of our oceans. The annual program for the Yacht BOAZ expedition commences in April of each year with seven people on board, consisting of the skipper, two watch keepers, one scientist , a videographer and two assistants.